Villagers of Altai are offering horseback tours of the mountains, and selling souvenirs crafted from felt matted from the wool of local sheep.Source: Alamy / Legion Media. In today’s relentlessly interconnected world, visitors to Russia’s remote Altai Republic may very well have discovered the ultimate luxury: living for a few days without e-mail or cell phone. On a recent trip to the Altai, I was disconnected from my office – and everything else that I could not see with my own eyes. Instead I could contemplate the silence of cedar forests, the grace of wild horses cantering through alpine meadows, and the beauty of glacier-fed rivers cutting through the republic’s rugged mountains. Lost for centuries in a mountainous cleft between Kazakhstan, China and Mongolia, the Altai features Siberia’s tallest mountain, Mount Belukha. To some Buddhist visitors, Belukha’s twin, snow-capped peaks form the gateway to Shambhala, a mythical “Pure Land” of peace, tranquility and happiness. 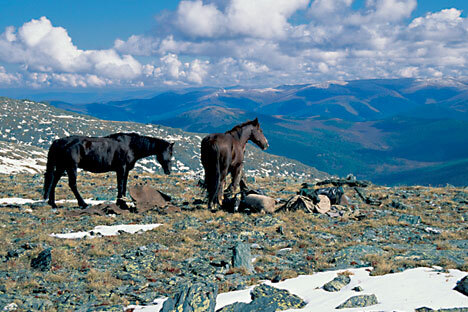 With its 4,500-meter high peaks and steep valleys, the Altai has always been the end of the road. Absorbed by Tsarist Russia 250 years ago to define an imperial border with China, Altai’s mountain peoples were largely left alone. To this day, the Altai Republic is one of only a handful of Russia’s 83 regions never penetrated by a railroad. The isolation of “Russia’s Tibet” was cut this year when engineers finished doubling the runway at the airport of Gorno Altaisk, the republic’s capital of 60,000 people. In June, S7 Airlines started direct flights from Moscow. On the ground, workers completed paving the “Chuisky Track,” a 600-kilometer road. Now, a smooth ribbon of asphalt, the Chuisky runs from the capital to the international border with Mongolia. On crossing into Mongolia, it immediately reverts to a rough, dirt track. The republic’s main paved road threads its way through the rugged Altai-Sayan Mountains. In Turkic and Mongolian languages, Al-tai means Golden Mountains. In mid-September, larch trees were exploding like bright yellow flares against a dark green backdrop of cedar trees. The Golden Mountains are now one of Russia’s nine natural sites listed among UNESCO World Heritage Sites. The higher elevations are home to the Argali sheep, the world’s largest mountain sheep. A ram can weigh up to 182 kilograms, including his two corkscrew horns which can weigh up to 28 kilos. Prowling at the very top of the food chain are the snow leopards. Well adapted to their high altitude homes, the leopards have wide paws to walk in the snow, thick fur to cope with the cold, and fat, extra-long tails to warm their faces when they sleep. Secretive and solitary creatures, the leopards are masters of camouflage. They usually only make their presence known when it is too late. They kill their prey with a single, decisive bite to the neck. The Argali and snow leopards inhabit the top of the world — a high altitude universe that circles in a massive crescent — south from Altai and eventually east to the Himalayas and Tibet. Both of these large mammals are endangered species. In the Altai, they may stand a fighting chance. Parks protect about one quarter of the republic, largely the mountainous forested parts. The Altai Republic is the size of Hungary, but has only 206,000 people — 2 percent of Hungary’s population. Ethnic Russians and ethnic Altai increasingly see their economic futures tied to up market eco-tourism. (On my return to Moscow, I was surprised to find that two affluent expat friends, neither of them Shambhala-seeking New Agers, had made nature trips to the Altai in recent weeks). There is also a demographic change underway. As in many areas on the fringe of modern Russia’s Slavic heartland, the Altai’s native peoples seem to be on the reproductive path to regaining majority status in their ancestral homeland. Under Stalin, the Altai, like many distant points of the Soviet empire, was a dumping place for internal exiles. Willing or unwilling, the transferred ethnic Russians took on the roles of colonists. By the 1939 census, Altai and other native peoples accounted for only 29 percent of the republic’s population. But the 2010 census shows that the size of the republic’s ethnic Russian population has been constant since 1939 – 115,000. At the same time, Altai and other Turkic-speaking native groups now account for 44 percent of the population. By the 2020s, Altai and other natives will probably account for a majority, ending an anomalous century of minority status. An Altai cultural renaissance can be seen in mountain villages. At two stops, my traveling party was entertained by throat singers, traditional bards of epic poetry. As in neighboring Mongolia, throat singers have regained popularity and social status in the post-Soviet era. In programs supported by WWF, or World Wildlife Fund for Nature, and the Citi Foundation, villagers are opening their houses to tourists, greeting them with bowls of mare’s milk, offering horseback tours of the mountains, and selling souvenirs crafted from felt matted from the wool of local sheep. A big hit with our group were toy felt snow leopards. On mountain roads, a resurgence can be seen of Ak Jang, the White Faith. Repressed first by the tsars, then by the Soviets, this shamanistic belief system was intertwined in the 20th century with Altai ethnic identity. Revolving around nature, mountains, water springs, the sky, fire, and ancestors, White Faith has spread in popularity in the 20 years since the collapse of the Soviet system. Thursday afternoon, at a way station above one of the Republic’s 7,000 lakes, we came across a hilltop grove of cedar trees. It looked as if it had been hit by an early winter blizzard. Fluttering in the high mountain sun were thousands of white “good luck” strips of cloth tied to branches. The good fortune was ours — to travel through Russia’s Shangri-La. James Brooke (Twitter: @VOA_Moscow) is the Moscow bureau chief for Voice of America. To view all “Russia Watch” posts, see voanews. com. The views expressed here are his own. First published in Voice of America.